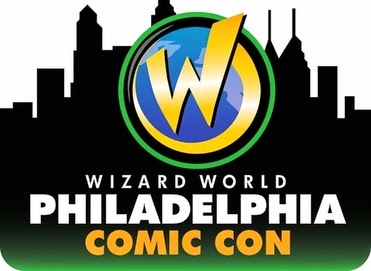 The Ace of Geeks: Wizard World Philly Report! I set out to take part in my first Wizard World Comic Con (and my first ever comic con!) on Thursday, May 7th, the kickoff day for the show. Accompanying me was my lovely partner-in-crime, Lisa. Traffic was light from New York to Philadelphia, so Lisa and I arrived fairly quickly, in about two hours. After checking in at the hotel, I started off walking the convention show floor as soon as possible. There weren't a ton of people on the first day, which didn't surprise me much because it was a weekday. Tons of merchandise stands with everything your nerdy heart could ever desire, as long as your nerdy heart wanted Funko Pop figurines. Seriously, they were everywhere. The convention exclusive Funko figurines I noticed were Stan Lee, and the Winchester brothers from Supernatural. I ended up picking up a Roger Rabbit Funko Pop figurine for Lisa. They got me. Or, rather, they got her. On my way around the floor, I was mostly interested in the artwork being sold by dozens of different artists. One in particular, Shad Nowicki, caught my eye. His paintings were REALLY good, and he took the time to create the canvas he paints on out of actual comic book pages or newspaper clippings, which are still visible through the art. It made for a really nice effect. I spoke with him for a while, and as a thank you for my time, he handed me a piece of art of Spider-Man drawn on an actual page of a 1960's-era Spider-Man comic book. Coolest thing ever! He also tossed me a tee from his booth. All of that, just for talking. His paintings were a little out of my price range, which I felt guilty about for the entire weekend. I wanted to own one of his works really badly. In particular, he had a painting of Doc Brown from Back to the Future which was just amazing. I totally suggest buying his art, for no other reason than to absolve my own personal guilt. I'd sleep better at night knowing I got this cool guy a few customers. I spent the rest of Thursday getting to know the layout of the convention floor, silently judging the quality of people's costumes, and hunting down a good cheesesteak, which I found at Steve's Prince of Steaks, not far from the convention center. The best costume I saw on day one was a Wonder Woman, pretty spot on. It definitely wasn't a store-bought costume. I should note that neither Lisa or I had the courage to do costumes of our own, although we did agonize over that decision a lot in the days leading up to the trip. I will DEFINITELY be doing a costume or two for my next con, though. More on that later. Friday was a little more lively. More people in costumes, and more events going on. I stopped by a Doctor Who panel which was headed up by the people who run DTForum, and while they weren't going over anything new for Doctor Who's upcoming Series 9, they did give out some really sweet prizes for trivia, such as autographed Titan Comics based on the different Doctors. Lisa knew pretty much every answer, but didn't shout loud enough to nab a prize. After that, I realized I didn't have anything for David Tennant to sign when I was to meet him the following day. So, I went back to the show floor and walked over to an artist named Javier Avila. I asked if he could draw Tennant as the Tenth Doctor for me, to have David sign it. He was backed up on commissions already, but agreed to do a pencil drawing and have it ready by the time I needed it. Very cool guy. He requested that I come back and see him afterwards to let him know how David liked it. More on that later, though. Avila was very cool, and some of his art blew me away. Had I come into the convention with more spending money, I would have taken home some of his inked and colored pieces. I did end up picking up a few pieces of art from an artist named Robert Kraus (or RAK). They were cartoony versions of all sorts of pop culture characters. I grabbed one of Batman and his rogue's gallery for a friend, a Wonder Woman, one with characters from the Rocky movies for another friend, and finally, one with classic wrestlers for another friend. The Ric Flair on that one? Awesome. He signed each piece of art, as well. As far as cosplay goes, Friday had more to offer. Lots of people in costumes, and this is where I realized that tons of people were cosplaying as Harley Quinn and Black Widow. Like, a lot. Too many. They were everywhere. Mallets and black leather all over the place. I was surprised that I had made it two days at this point without seeing a Deadpool cosplay yet. That would change on Saturday. By far, the best costume I saw on Friday was a man dressed as Arsenal from Arrow. No exaggeration, it's like this guy walked onto the set of the show and stole the costume. It was that good. He even had the red bow. He was hanging around by the signing area where Michael Rooker and Lou Ferrigno were signing autographs and taking photos. If you're reading this, good job buddy. That was a really cool costume. Another dude had a really impressive, hand-made, Captain America Age of Ultron costume, with a shattered shield. He looked the part, too. Another great costume. I headed back to the hotel, grabbed another cheesesteak, because I made it a rule to eat at least one cheesesteak per day while I was in Philly, and took a break before heading back in for Dolph Ziggler's Q&A session. Before I go on, though, something happened on Friday afternoon that cast a bit of a shadow on the trip. A woman was crossing the street outside of the convention center, distrated by her iPad, and was struck and killed by a tour bus. I'm not sure if the woman was visiting Wizard World or not, but that was a bit depressing. A big crowd of people were gathered outside, some witnesses to the accident, speaking to the media. Messed up. Take it as a reminder to always pay attention when crossing through traffic, no matter your age. Back inside, we headed to Dolph Ziggler's Q&A session. The turnout was impressive, we had to stand in the back. Dolph was really cool to all the young fans and really funny, as expected. He spoke about his standup comedy dates and who he'd like to face at WrestleMania 32. He chose Shawn Michaels, even after stating that Shawn Michaels circa 1997 versus him now would be his dream match. Gotta agree there, that'd be something special. One fan got up to ask a question, and started with, "I'm gonna ask something I know everyone here wants to know..." and he responded by saying, "It's not my kid, man." That got a lot of laughs. He made a point to state that working for WWE has good days and bad, but he would always want to be a part of WWE for his entire career when asked if we'd ever see him in TNA in the future. I got up at around 6:45am on Saturday, to go wait in line for David Tennant and Billie Piper's Q&A session, which was starting at 10:30am. There were already about 30 people on line when I got there at 7:30am, but I'm glad I went early. As the morning went on, the line got crazy! Hundreds of people, some in Doctor Who costumes of their own making, and lots of Tenth Doctor cosplays. Lisa and I were sitting on line with a guy who brought his daughter and her friend along, and they mostly talked about how dreamy David Tennant is and how nervous they were to ask him a question. In between the small meltdowns, they watched Doctor Who episodes on a laptop. Cool people! Finally, they let us into the Q&A area, and I was shocked at how big it was. Shocked, but also REALLY glad I got there as early as I did, because we ended up in the center of the fourth row. Great seats! The Q&A itself was awesome. Billie and David seemed as comfortable as ever with each other, joking and laughing and giving lots of love to their fans. The two young ladies that were on line with us nailed it when they asked their questions, getting great crowd reactions. Wizard World live streamed the Q&A on YouTube, so I'm sure there's a recorded version you can find somewhere to watch it (and see my bald head moving about in the crowd). As time winded down, the Q&A was set to end, but David and Billie insisted on continuing a little longer to allow a few young fans in Doctor costumes to ask their questions. Very cool of them to do so. I was hoping for a little break after the Q&A was over, but we got rushed right over to the area on the show floor where they'd be taking photos with fans. I'm going to be honest, and this applies to the entire weekend as a whole, there wasn't a lot of organization in telling people where things were located, so we scrambled a bit to find the line. Once we did, though, it moved pretty quick! I was only on line for the photo for about 40 minutes, with hundreds of fans waiting. Lisa took her photo with Bille and David solo, and then I came in for my photo with her, all four of us. I was wearing a t-shirt with David Tennant and Matt Smith wearing suits and pointing their sonic screwdrivers out, sort of like Pulp Fiction (I believe it was a TeeFury.com shirt). Billie and David both commented that they thought the shirt was cool. Made my day. Photos came out great, and we finally had some freedom to move around before the autograph signing at 2:45pm. Admittedly, I was a little disappointed that I couldn't take part in more things Wizard World offered due to my commitment to the David Tennant and Billie Piper stuff. I would have really loved to meet Stephen Amell and Adrian Paul, but they were both were doing their signings at the same times we needed to be elsewhere for the Doctor Who stuff throughout the day. By the time I could grab a spot to take a photo with Stephen Amell, it had sold out. No surprise there, that guy is awesome. I headed back to Javier to pick up the art I commissioned, and it came out just as good as I thought it would. We left the convention center to grab a bite, then went back to get in line for the autograph signing. Now, here's something I wanted to whine about a little. We purchased VIP packages for the Doctor Who stuff, but apparently they sold about 2,000 of these packages which I feel is too many. It didn't feel very VIP to still be waiting on long lines for things all day. We were also promised access to the show floor 30 minutes prior to general admission, which I don't recall ever happening. Either way, getting into the show floor 30 minutes early is only a benefit if you're there to spend a ton of money on merch, because none of the guests were there as soon as they opened, and even then, the lines at merch booths were non-existent even on the busiest day of the convention. Rant over. I want to explain the really cool things we had for DT and BP to sign. Months back, for Lisa's birthday, I commissioned an artist to hand-paint a pair of Converse All-Star sneakers (the trademark footwear of the Tenth Doctor, for the uninitiated). One shoe had the Sonic Screwdriver and a pair of 3D glasses, with the quote, "Oh, yes!" on the inside of the shoe. The other one had the TARDIS, with the quote "Bigger on the Inside" on the inside of the shoe. Both David Tennant and Billie Piper were sort of amazed at them, and asked where we got them. I later contacted the artist and told her about their reaction, which made her year. Cool feeling. I myself, had my art from Javier, and both of them asked if I had drawn it myself, looking pretty impressed as they scanned over it. So, I was able to take that back to Javier and tell him how much they liked it. He snapped a photo of the signed art, and shook my hand. Another cool feeling. I spent the next few hours circling the floor, debating on buying a canvas painting of the Final Fantasy VII cast that was being sold at one of the booths. Ultimately, I didn't (I don't have a lot of space in my apartment to hang paintings). We heard about an after-party taking place at a bar down the street from the convention center, so we decided to head back to the hotel, get some sleep, and head over there. I wish I had stayed a little longer, because when I got back to the room and loaded up the live stream of the event, the cosplay competition was underway and I was missing it. Bummer. While I WAS there, though, I saw tons of really great costumes on Saturday. One woman was cosplaying as Lightning from Final Fantasy XIII. Her costume was perfect, down to the hairstyle, holster and folding gunblade. She was about three people ahead of me on the line for David Tennant. This is also where the army of Deadpool cosplays came in, as expected. That guy who cosplayed as Arsenal? I didn't see him again, but he should have stuck around, because there was a group doing the Arrow cast, and their costumes were just as awesome as his. Black Canary, Arrow, and even a Flash based on his design from his CW TV show. Fantastic stuff. There were a few Spider-Man cosplayers running around, but none of their costumes were particularly awesome, except one. He had the Future Foundation Spidey costume! My favorite, though, was a guy doing Absorbing Man. I liked it not only for the choice of character, but for how awesomely he pulled it off. Half his arm and chest were painted as stone, and it looked really cool. We also got a look at someone in a River Song costume from her appearance in the Impossible Astronaut episode of Doctor Who. It matched up perfectly. The award for most awesome character choice goes to a guy who was cosplaying as USAgent. In a post-Age of Ultron world, it was nice to see someone NOT cosplaying Steve Rogers. Anyway, the after-party was held at a place called the Field House. Some people showed up in their costumes, but most were done with their cosplaying and came to unwind. There was a live band called Critical Hit, who played versions of songs from Mega Man II, The Legend of Zelda: A Link to the Past, Metal Gear Solid 2: Sons of Liberty, and others. They were really good, and their violin player (yep, they had a violin player) was outstanding. Lisa and I sat down with a few people who were visiting from out of town, although I don't remember where they were from, exactly. They told us that they spent about 45 minutes with Hayley Atwell (Agent Carter) and went on about how friendly and complimentary she was (I caught a look at her as I was walking around, and I gotta say, she's even better looking in person, like Billie Piper). They were really friendly and cool, that's all that matters. Everyone was really friendly and cool. That was my favorite part of the whole experience. By Saturday, I felt weird NOT being in a costume with everyone else. That's why I'm definitely doing something the next time I hit one of these conventions up. Any suggestions for a costume for a 160-pound bald guy? Sunday, it was time for us to check out early. We had to get back home to New York, so we didn't have time to take a final walk around the convention, unfortunately. I wrote this up as soon as I walked in the door a few minutes ago, so after I close this out, it's time to start shopponig for a frame to hang this awesome David Tennant art in! Allons-y! William Couillard has been a New Yorker and a Comic Book fan for most of his life, and is probably best well known on the internet for running The Destron Forums for years. And for losing to our Editor in Chief in a falls count anywhere match.